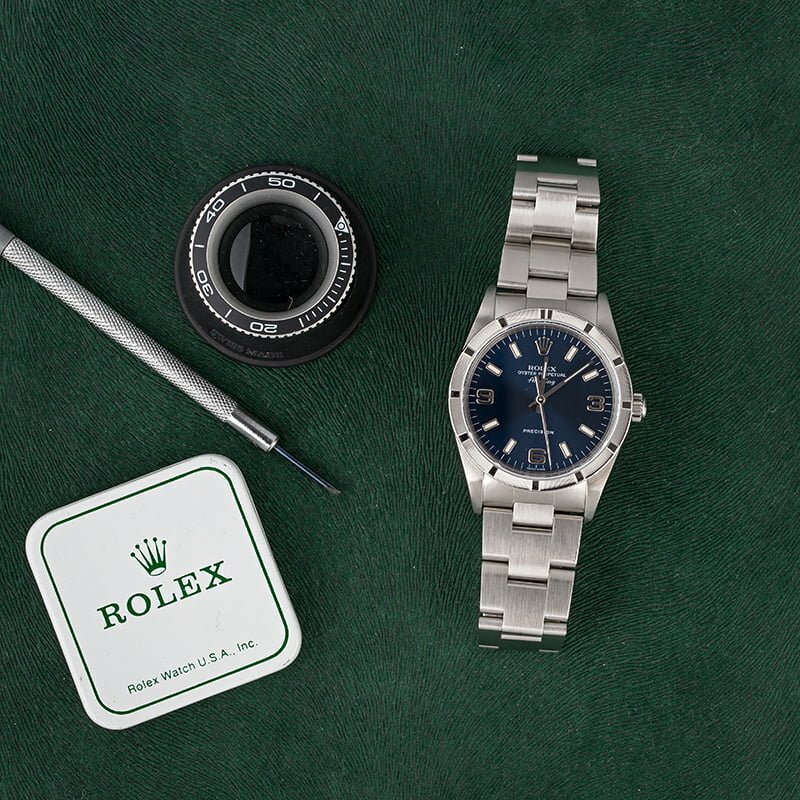 Today, Rolex watches come with an assortment of bezel options including smooth, fluted, ceramic, graduated, and gem-set. 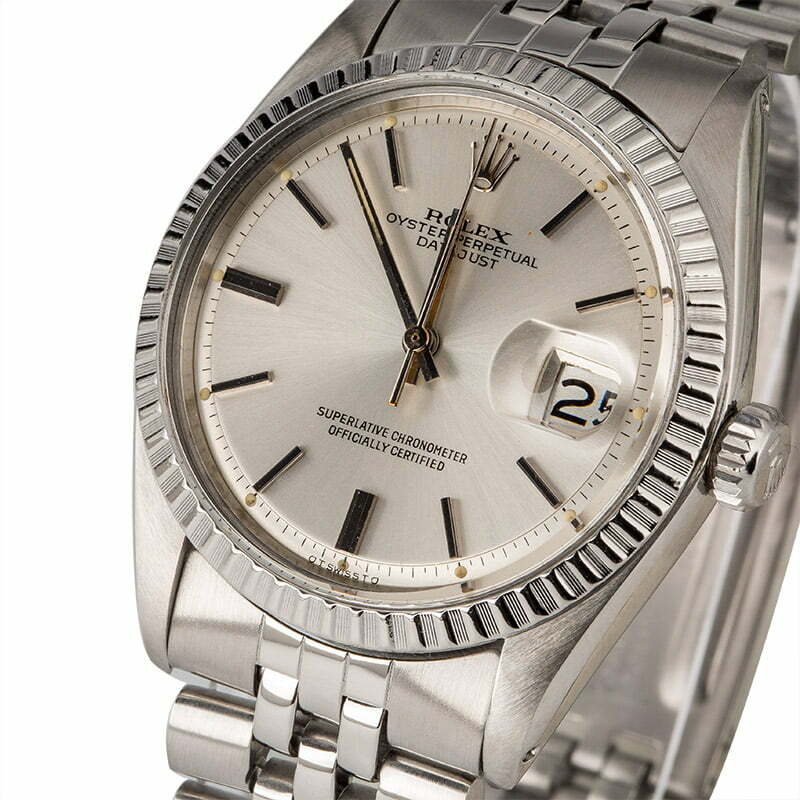 However, there is a particular style of bezel that Rolex once used called engine-turned bezels. Engine turning is sometimes referred to as its French name, guilloché, and it denotes a decorative technique whereby an intricate and repetitive pattern is mechanically engraved into a material via a specialized machine. Although Rolex no longer makes engine-turned bezels, there are still some discontinued models available in the secondary market. Let’s explore some options. This Air-King has an Engine-Turned Bezel, but not all Air=Kings have them. This particular engine-turned bezel on the Rolex Air-King is highly distinct. Accompanying the repetitive fine lines engraved into the stainless steel bezel are polished wider metal blocks at each hour marker. Together, the contrasting details form an appealing geometric style. The majority of steel bezels on Rolex watches are smooth ones, so an engine-turned steel bezel is a great change of pace. It’s also a solid alternative when you want a decorative bezel but are not too keen on the flashier gold fluted versions. You can see the details of the engine-turned bezel here. This vintage Rolex Datejust also comes with a steel engine-turned bezel, but in a different style to the Air-King one. This time, instead of larger blocks at each hour marker, this engine-turned style features a continuous pattern of polished peaks separated by fine lines. 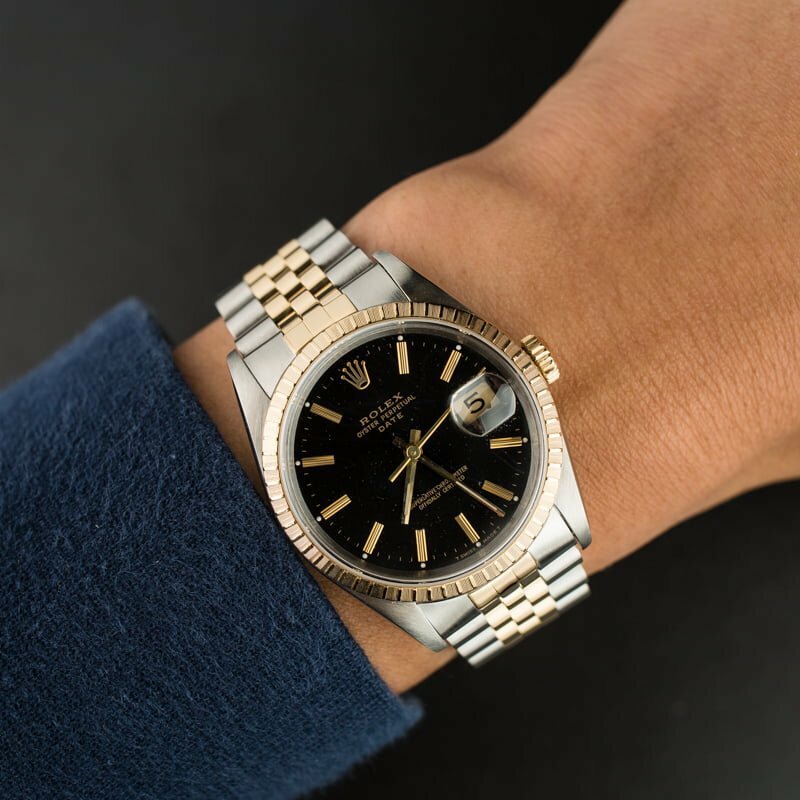 At first glance, the style of the specific engine-turned bezel is quite similar to the iconic Rolex gold fluted bezel, but upon closer inspection, they are indeed different. Note the intricate fine lines on the engine-turned bezel that are not used on the fluted bezel. Furthermore, it’s important to mention that Rolex exclusively uses gold for their fluted bezels, so a steel engine-turned bezel will have a different luster than a white gold fluted bezel. Engine-Turned Bezels on this two-tone Date makes the watch appear elegant. This Rolex Date watch sports an interesting example of the engine-turned bezel because it is made not from steel, but 18k yellow gold. It is not that common to find 18k yellow gold engine-turned bezels since Rolex prefers to turn gold into fluted bezels. Again, while it may be mistaken for the traditional fluted bezel, the grooves of the gold engine-turned bezel has more texture thanks to the combination of fine lines and polished raised notches. If you’re looking for a bezel design that’s unlike what is commonly found out there, then an engine-turned one may be just what you need. Different, distinctive, and discontinued, an engine-turned bezel adds a little something special to a Rolex watch. While the bezel is uncommon, it isn’t as rare or collectible as other bezels like the GMT-Master Blueberry.